Mainly sunny. High 76F. Winds SSW at 5 to 10 mph..
A mostly clear sky. Low 58F. Winds S at 5 to 10 mph. 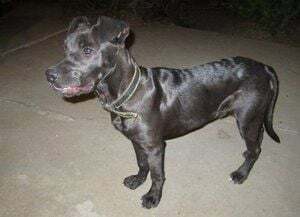 We found this friendly medium-sized black male pitbull mix on the corner of Scott Ave. and McCollum St. near Mayberry St. Elementary School. He has a collar but no tags. He couldn’t have been on the street long because he kept crossing in front of our moving car. Contact Jacinto at denisejacinto@att.net or 213-215-0250. Lost & Found is part of The Eastsider Forums, where Eastsider readers can post announcements or start a conversation on neighborhood news, issues problems & ideas. Click here to find out how to share your news & views.